Really amazingly nice piece. The drawers glide well and have a ton of room. The style has just the right amount of vintage feel. And ... only had to attach the legs- No other Assembly required! First of all, thank you to all who review products on Overstock, it is such a help when purchasing online. I ordered two of these nightstands in sandstone and could not be happier with the classic way they look in our guest bedroom which is set up with the Jezebel tufted headboard (sand color) also purchased from Overstock. They look exactly as pictured but are far better in person. Solid wood, heavy and constructed very well...they look every bit as good as high end furniture without the high price! I was very skeptical about ordering these nightstands because wasn’t sure about the color but once got them I was please. These nightstands are very well made, very sturdy and perfect size. I can’t get over the details and crafting of then as well the hardwares. The drawers are very spacious and deep plus I love the built in power plug for phone/electrical. Very happy with my purchase. This is a beautiful nightstand. Darker and looks more gray than pictured but the color still worked nicely. I love the hardware and the usb jacks on the back. First one I received was slightly damaged. I repackaged and contacted Overstock and they sent me return label immediately and sent out a replacement as soon as the damaged one was shipped. The whole process was quick and efficient and I had my replacement nightstand, in perfect condition, later that same week! Thanks Overstock for the excellent customer service! I like the fact that this nightstand has substance and is well made. The off-white design painted over the grey-blue wood patina is delicate and unusual. I have not seen anything like it. Whoever designed it took pride in making it quite unique. The drawer is spacious and yet not overbearing. The bottom part is wonderful to have for extra storage, and it closes and opens easily with an attractive handle. I like to hide what is inside. It gives it a neat look. The color is soft and pleasing. It blends in so well with my grey-blue silk headboard. The size of this nightstand is perfect. I would actually like to order a second one for other side of bed. We love these nightstands. They don’t have as much blue as in the pic but that is fine for our home. They seem to be sturdily built, with easy open drawers. 1 electrical outlet and 2 USB ports to power up we need. Great style and nice, larger size to hold lamp, book, water, plus more. Easy assembly by just screwing in the legs. They are a little heavy so help may be needed if you aren’t used to lugging things around. Just love them! Bought 2 of these nightstands. They arrived in 2 days and are absolutely beautiful. A great brown and gray color and just the right height and size beside a king size bed. 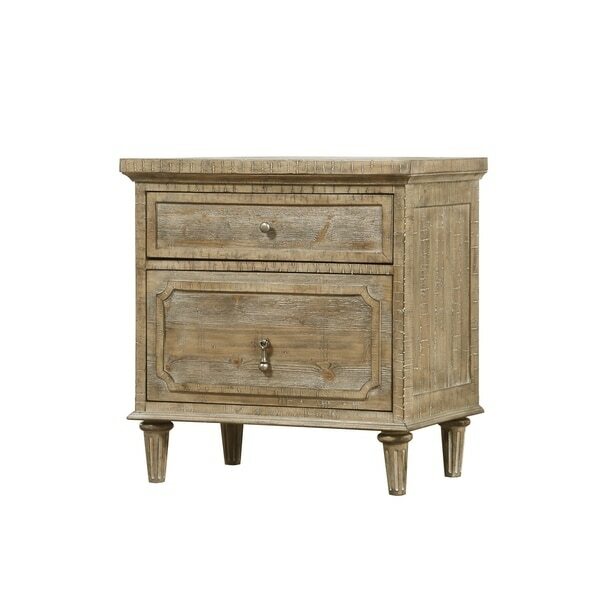 Love the little pull on the bottom drawer and the distressed finish. If you’re looking for a solid piece that matches a light bedroom with dark floors look no more! Solid wood construction with two USB ports in the back make this an optimal nightstand for those high tech folks who wish to connect but not have all those extra cables. Really cute nightstands. I ordered these for staging a model home. One of them had a damaged spot on the back of it when it arrived, but you can't see it. Wish they were a little larger. Beautiful nightstands for the price. I looked for months and couldn’t find anything solid wood like these! I’m very happy with my purchase. My only complaint is that the drawers don’t seem to close all the way because they may not be perfectly lined up. They are absolutely stunning! Once I placed them in my Berlin, they picked up the distressed colors of my gorgeous new bed and the room started to come together! Exceeded expectation! Ordered matching bureau, awaiting delivery. Very well made and sturdy. I love the textured wood. Love the look of these night stands. Rustic modern. The wood looks a little cheaper in person but you have to be up close to notice. I think for the $ they are a great deal. Love the fixtures on them and just realized they have outlets in bag for phone chargers. Overall satisfied. So excited when the box arrived and I did not have to put it together. It is beautiful and sturdy, such a nice piece of furniture... better than what I found in local stores. Love the color and could not be happier! These are very well made. They go perfect with my bedroom furniture! Great deal! Really like the plug and usb outlet built in. "What color is this? One of the review says it is not gray as pictured...."
The color and rustic look. Love the color & distressed look! New furniture for my daughter and we loved the color and distressed look of the wood.